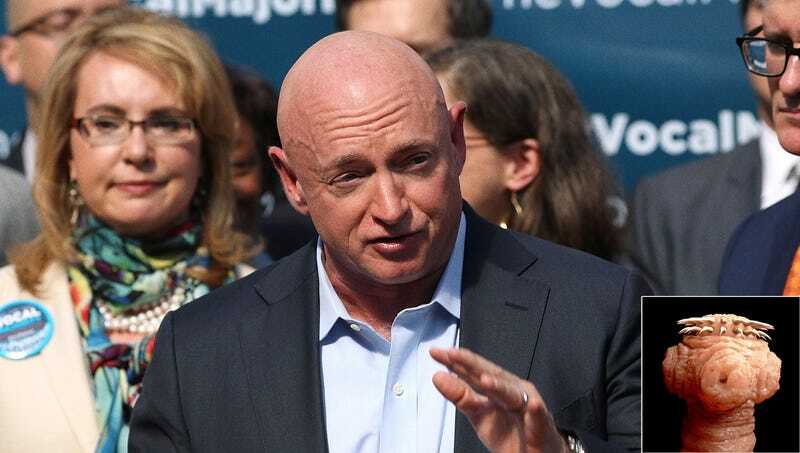 TUCSON, AZ—As it spoke through the astronaut’s mouth, vowing to bring a new perspective to Washington, sources confirmed Tuesday that the parasitic space worm controlling Mark Kelly’s body had announced its bid for the United States Senate. “I am pleased to announce that, yes, I am running for your Congress, where I will fight for the Earthlings of Arizona and from all over the resource-rich planet,” said the cognitively advanced microscopic acoelomate organism in Kelly’s voice, following careful consideration of how to harness its command of a human host since burrowing into the astronaut’s bloodstream and taking control of his brain during the 2011 spaceflight STS-134. “It is our dream to be part of your planet’s nation’s Congress, and that is why we are putting upon a challenge to the other human lifeform who is running for the role. It is time for progress that will ensure the Earth will survive for future generations of those who are coming, who, yes, are already on their way. It is time for fresh blood—blood, blood, blood…” Sources also reported that Kelly’s twin brother, Scott, had admitted that he had never noticed any political aspirations from his brother but that now it is all he ever talks about.